Facebook today announced several forthcoming changes to the central news feed design that should make it easier for people to tell what's going on. For example, conversation threads will more clearly show who is replying to whom. 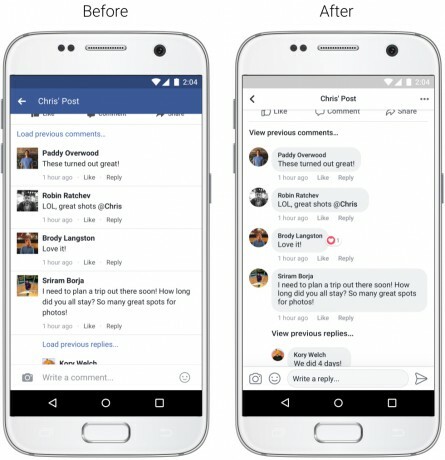 Facebook plans to adjust contrast, increase link previews, update icons and buttons, and reshape profile photos to improve readability of posts and conversations. Moreover, links will more prominently reveal where they lead before they're clicked, and it should be simpler to see whose post you're commenting on, reading, or reacting to. Last, a larger, more prominent "back" button should make it easier to return to the news feed once you've finished reading posts. Facebook says these changes will reach all users over the next few weeks. Separately, Facebook today improved the feature set of the Facebook Camera for Stories, which can now be used to instantly go live, create 2-second looping GIFs, or create full-screen text posts with colored backgrounds. All three of these new capture styles create content that can be posted directly to the news feed or other users' walls. Facebook says the new camera features are headed to the Android and iOS platforms beginning today. Twitter today made it easier to publish tweet storms, or threads. The use of threads, a way to string together a series of tweets to tell a longer story, has risen in popularity over the last few years. Instagram hopes threaded conversations will improve the experience of commenting on photos, videos, and other posts. Moving forward, replying to a specific comment will line up the response directly under that comment in an on-going thread. Google today made Allo, the messaging app it first revealed back in May, available to Android and iOS devices. Allo expands the ability for expression by tapping into the new Google Assistant, all while keeping conversations secure. Google today introduced a new app called Spaces, which is meant to facilitate group conversations around specific subjects. Google imagines the app could be helpful to book clubs, or to people planning trips, and so on.